For rough carpentry, and if you are not extending a line a significant distance, the sloppy tolerance of the PRO SITE 505A may be fine. If not overly abused, it even appears it would give years of use and much convenience. Still, why pay a penny for a tool which does not do what it was designed to do? For true fine woodwork, you, obviously, need precision cuts. They require accurate measurements. 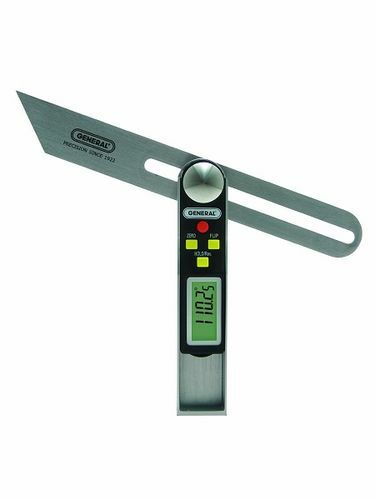 As such, this is not the tool for such purposes and you may want to look at digital gauges or, if applicable to your needs, an adjustable protractor, such as is often sold in a set with a center finder and a try square. In many cases, they may be cheaper and just as, if not more accurate. Eighty-nine and a half, or ninety-one and a half degree joints (forty-four and a half or forty-five and a half degree miters) for a picture frame can add up to a couple glaring degrees when a job is assembled. Such gaps are quite visible and, certainly, the earmark of amateur or cheap work. As others elsewhere noted, Starrett sullied their name with this one and I will never again presume to associate the Starrett name as a guarantee of precision. From my purchase of this, I would not be comfortable putting down several times the money spent on the competition’s measuring devices to get the Starrett name. Disappointing to read. I had considered one of these because I need to do some trim work in the house but I can’t really justify $125 for the Bosch. Starrett has a cheaper version, the 505P-7, which has better reviews than this one, might give it a try. Starrett has tools made in other countries including CHINA. I don’t think this tool was designed for the precision needed for metalworking. The cheap price bears that out. MrRon, this isn’t even designed for the tolerances of woodwork. A kid’s school protractor is more accurate that this, and is a fraction of the price. There, really, is no excuse for the sloppy readings this thing gives, unless you’re using it to freehand cuts for fence posts, or the equivalent. For woodwork, like you find on these pages, it’s trash. Rick, I posted a review on one of the little, twelve inch digital jobs, which are cheaper than this. I gave it a good review for good reason. At twenty bucks, you might consider it. I keep on in my van tool bag and one in the shop. I have this same protractor and have noticed the same issue. I bought it at WoodCraft a few years back and I don’t know why I never returned it (it wasn’t exactly cheap). It was my last Starrett purchase though and is a horrible tool that has pretty much completely turned me off the brand. I’ve been putting up trim and discovered that unless the wall is really flat you need a longer gage. I ended up making a template of the corner using scraps and super glue, then measured the angle off that. Worked really well.